WELCOME TO MY MONEY MISSION ONLINE: Puritan’s Pride: $0.99 Vitamins + FREE Shipping! 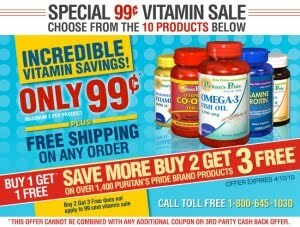 Puritan’s Pride: $0.99 Vitamins + FREE Shipping! WA-HOO! Puritan’s pride has some awesome deals available thru 4/10! You can score 10 different vitamins (30 ct) for $0.99 each + FREE shipping on ANY order! ONLY $0.99 for Vitamins shipped right to your door! Just head on over here and scroll down to see the 10 different vitamins available for $0.99. I used to get vitamins from them, for my Grandmother, and they are a terrific company to order from! Everything is always packed very securely and they have fast shipping! Thank you! I've been trying to find a way to get some of my pills cheaper. You are wonderful! I've looked all over the site and I can't find the $.99 vitamins. Can you give me the link?